Ferry reservations for summer sailings almost here. 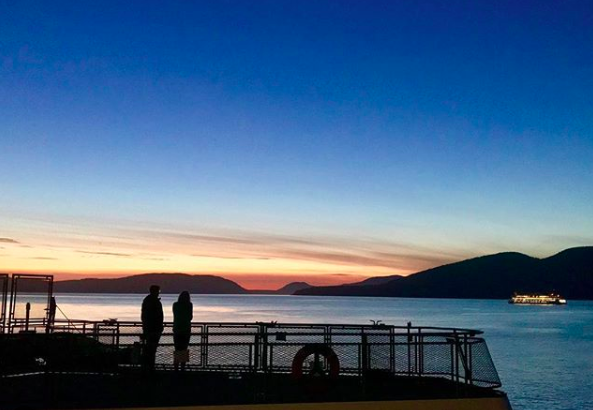 2019 Summer Ferry Reservations to/from the San Juan Islands! Beginning April 23rd at 7AM, the first 30% allotment of space will become available to reserve for sailings for the busy summertime in the islands. Reservations will be available for sailings between June 23rd through September 28th, 2019. San Juan Islands 30/30/30 tiered release of space occurs at 7AM 2 months prior to each season start date, then 2 weeks, and then 2 days prior to each sailing date. Reservations for the Summer 2019 sailing schedule will be available for the San Juan Islands beginning April 23, 2019 in the 1st tiered release. You are not pre-paying for your ticket when you make a reservation, you're simply securing a spot on your desired sailing. Reservation holders have priority and limited spaces per sailing are available for drive-up travelers. If you don’t have a reservation, at busy times you may wait multiple sailings for a space. Arrive to the terminal at least 30 minutes before the scheduled sailing. Arriving up even a few minutes late will lose your reservation and you’ll be placed in the “standby” queue. Reservations are easily modified and/or canceled up to the day before your travel reservation if your travel plans change. Remember 30% of capacity is released 2 weeks and another 30% is released 2 days before the sailing date. Below are some screenshots from the Ferry Reservation Website. When you visit the site, you’ll want to click on the green RESERVE NOW button in the middle of the page. From there, it’s pretty straightforward to complete a reservation on your dates of interest. Visit www.takeaferry.com and click the “Reserve Now” button to begin. Selecting all of your details and adding the reservation to your card for checkout. 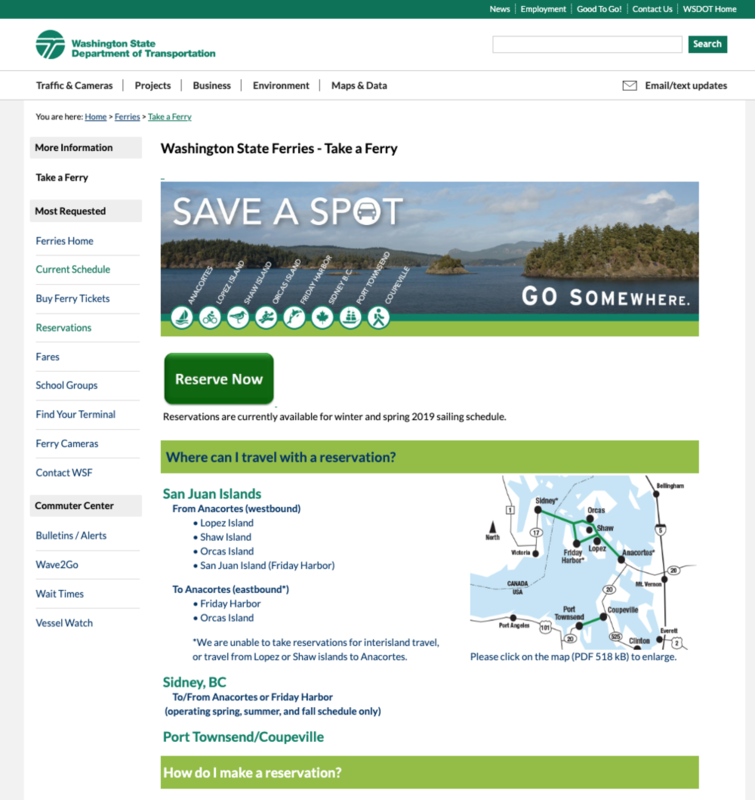 If you have any questions, you can call a Washington State Ferry agent toll-free at 1-888-808-7977 from 7:00 a.m. until 5:30 p.m. Pacific, seven days a week. We hope you found this helpful and we look forward to having you stay at Orcas Island Getaway! As always, we’re happy to help answer any other questions that might come up. Sign up with your email address to receive discounts, specials and updates. We respect your privacy. Unsubscribe with 1-click at any time.